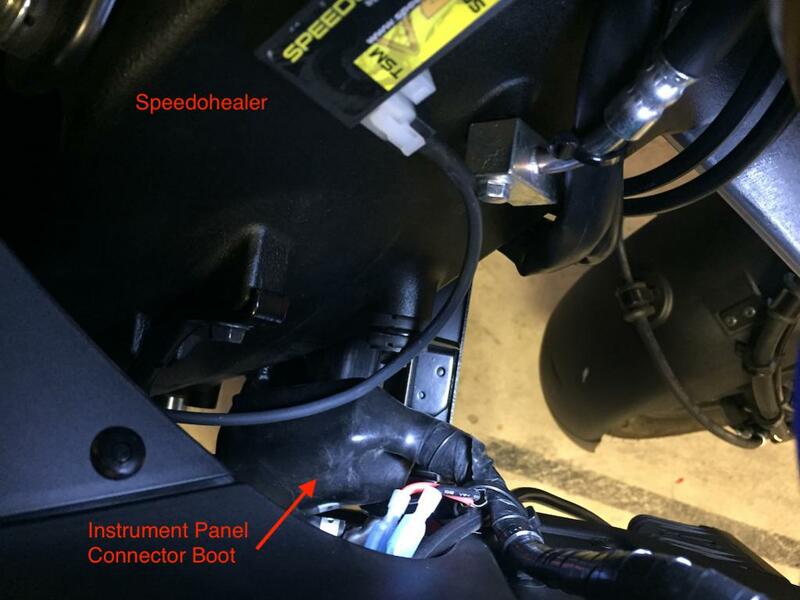 2014+ DL1000A Speedometer Correction Success! Like so many others, I noticed that my speedometer was reading high. When it said I was going 70mph, I was actually going 64. I know that this topic has been discussed at length so I won't get into it too much other than to say that since the ABS was added in 2014, it's made the process of correcting the darn thing much harder. As others have noted, you can access the Speed Sensor Output Signal (pink/white wire) at position T37 on the small connector of the ECM. It's really easy to spot because it is right on top of the bundle. BUT, since my bike is brand new and still under warrantee I am loath to do anything (like cut into the ECM cable bundle) that might cause any questions should I have to take it in for covered service. So, the question is where else can I get to it that is relatively easy to get to. Taking off the instrument panel is a definite bugger and accessing switched power is not really nice. Plus, how do you get to your device should you want to change your adjustment? 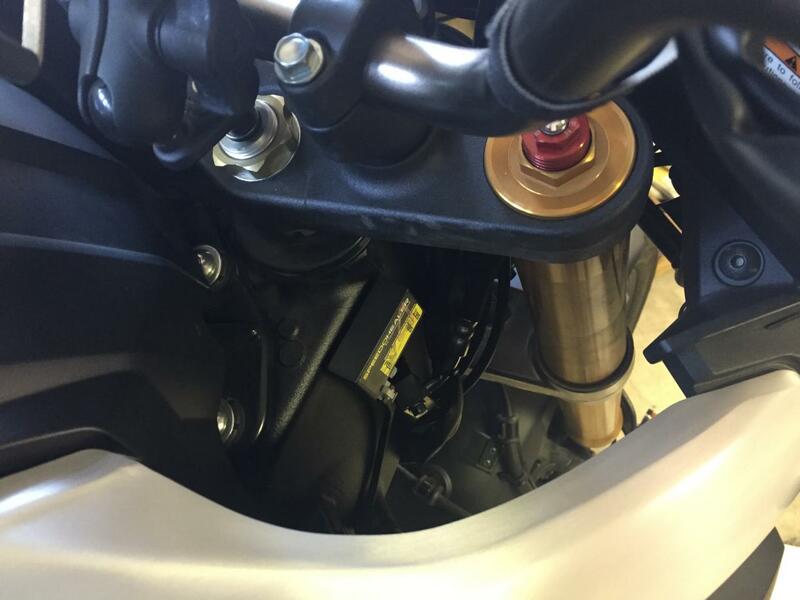 1) Remove the right hand radiator side cover (the lowest cover with the single bolt holding it on). You might also want to remove the aluminum trim piece at the top of the tank to make it easier to reach down. 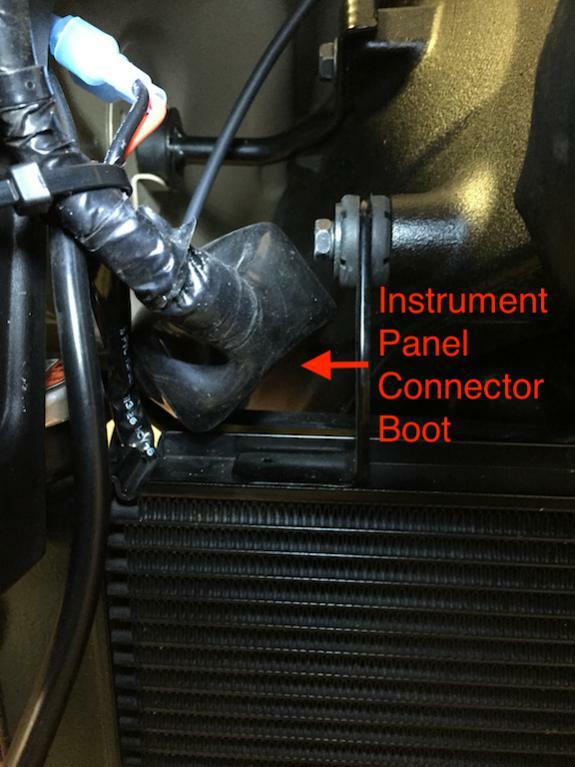 2) Locate the Instrument Panel Connector Weather Boot at the top left of the radiator next to the radiator cap. (images 3 and 7) Pull the cap back and unclip the three connectors. They are all keyed and can not be misplugged when you reconnect them. 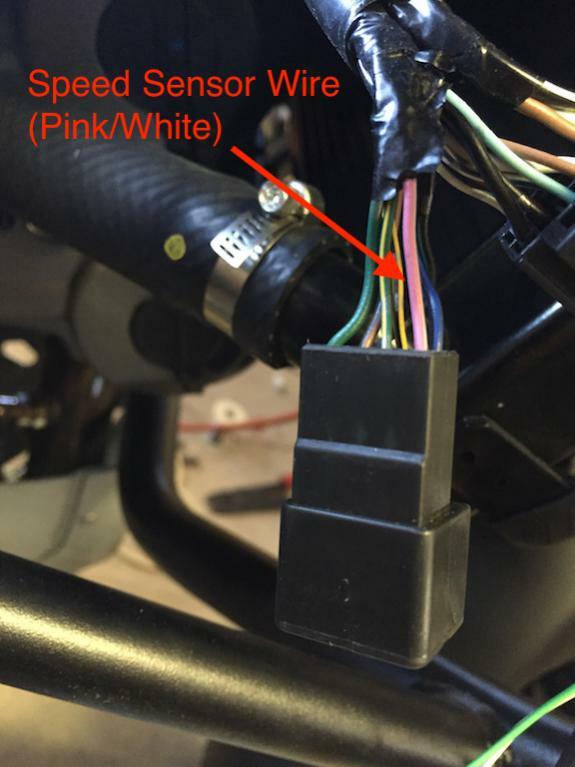 3) The Speed Signal is the top connector and is the pretty pink and white wire. (image 4) You will have to cut the black tape around the bundle back a bit to give yourself enough room. 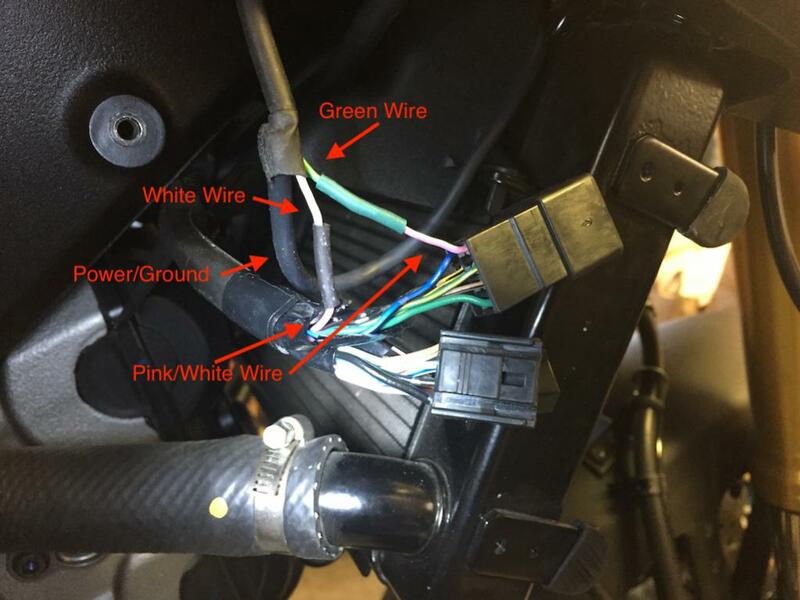 4) Cut the pink/white wire half way between the hard bundle cover and the connector. You can use the splicers that come with your kit but I prefer to solder the wires and cover with heat shrink (image 5) but whatever you do, make sure you have a good and permanent electrical connection and that the correct wires are on the correct side. 5) For the switched power and ground I used the Heated Grip connector hidden behind the center of the radiator beside the other connectors there. Using Suzuki part#36852-06g00 I was able to bring the signals out to a place I could access them. Actually, I had installed auxiliary lights previously so it was already there. Just be sure to keep the polarity correct as both wires on the adapter are the same. 6) I located the correction device (SpeedoHealer) on the front of the frame just below the triple camps where I can get to it easily in case I want to adjust it. Hey, I live in California so you all know I never have to worry about rain. After I plugged everything back in, put the covers back on and readjusted the clock (the only thing that got reset) I entered a correction of -8.2% and WOW, it really worked. It's now spot on, or as close as I can tell with a GPS and a speed sign near the house. Although I can't be certain, I imagine the SpeedoDRD and the other devices would mount similarly. Scorch, Bugzy, Vaseface and 3 others like this. Yep. Been there, done that. Page 5 3/4 way down. Yeah, saw that but thought I'd add the step-by-step with photos. Also, I never like having to cut or splice into more wires than absolutely necessary, so that's why I mentioned using the Heated Hand Grip connector for switched power. There's not much length exposed on the switched power and ground wires in the Instrument Panel connectors (as mentioned in the other thread) so trying to clip or splice them and then get everything back under the boot seemed a little too difficult. Bought the DRD from AdventureTech, Great Service Rick!! When I first picked up my Vee2 I noticed that the "your speed" signs in the neighborhoods were different than my speedometer reading as well. However, when I setup my cellphone running a GPS based speedometer app I found that my speedometer was not off by a percentage as one would typically expect. It would always read +4 mph whether I was going 15, 25, 35, 50, or 70 mph... for this reason I never looked into correcting it since all the correction devices just gobble up and then re-transmit a percentage corrected pulse to the ECU. Has anyone else experienced this? Or am I just going crazy? Perhaps another test to confirm is in order. Incidentally, I have "spot checked" the speedometer in my car by timing with a stopwatch between the mile markers and found it to be right on. This was confirmed by comparing it to the same speedometer app as was used on the motorcycle. So it appears that the GPS speedometer app on my phone is at least working correctly. Last edited by Grimmer; 08-11-2016 at 08:51 PM. Some of the GPS devices are not very accurate. Also, the longer and straighter the run, the accuracy of any GPS device be better for speed & distance. 1) There was a latency between the time I hit a particular speed and the time the GPS indicated that speed. 2) The speed indicated by most of the apps jumped around a lot even when I was running steady so there didn't seem to be any peak averaging going on. 3) The speed on the Garmin seemed to be the most accurate but the Magellan was pretty decent too. 4) The local Speed Sign seemed pretty accurate too. All those things being said, my speed seemed to be off by a definite percentage so once I corrected it by -8.2% is seems to be spot on, as close as I can tell. 1) The odometer was reading high too, but not by the same percentage so now it reads a bit low. 2) Along the same lines, the indicated gas mileage has decreased. But I'll put up with both of those to know that the indicated speed is the actual speed. All the speed indicator signs used by the cities indicate I'm going 5mph slower than what my speedo shows. I always just subtract 5mph now. I want to use this plug to power a set of heated grips. I tried to see which one was ground and what I found was that the white with green and the black with white wires both had continuity to ground. How did you tell hot from ground?